You’ve scheduled the meeting, drawn up the agenda and invited the relevant family members. First, congratulations on getting the conversation started. Open communication within your family about your parents’ long-term goals will make it easier for everyone in the future. Their plans and hopes for the legacy that they will leave behind. Discuss the ultimate division of caretaking roles (should they be needed). Of course, it’s not easy to initiate a conversation about health and finances with anyone, let alone with your parents in the context of getting older. Some parents may feel defensive or put on the spot, or they simply may not want to share the details of their finances. Perhaps they have not planned and don’t want to feel embarrassed. Or, they may perceive that you and your siblings disagree with each other about what is best in the long term. No one wants to be unexpectedly probed or challenged about such personal and possibly controversial decisions. Keep in mind that the dialogue you have begun is designed to ease any tensions and encourage harmony, not to simply pry or stir the pot regarding financial matters or plans for future care. Many older people are instinctively secretive about their plans. This attitude is not likely to change with one chat or two. The topic of long-term planning must be approached in a way that assures your parents that no one is trying to take control or take advantage. Assurances must be made about the safeguarding of confidential and private information, which will only be used to make appropriate decisions in an emergency or if your parent needs some assistance in making an important decision. It may help to remind your parents of a recent situation experienced by a family member or friend as an example of why it is so vital to share this information before an emergency arises, necessitating assistance with addressing various financial affairs. To set minds at ease, assure Mom and Dad that their private information will only be disclosed on a “need to know” basis. People who are helping with healthcare decisions or day-to-day living need not know anything about the terms of their estate plans (wills, trusts, etc.). The person designated as power of attorney will only have access to the financial information needed to act on their behalf during their lifetimes and need not know anything about particular health issues. It is also important to stress that the power of attorney does not affect their estate plans as it expires either at their death or some other triggering event. You may already know the name of the attorney or accountant your parents use, but there may be other advisors involved. You will want the name and contact information for their physicians and any specialists who treat them, for example, and their housekeeper, property manager or other household staff, if they have them. It is important to know who they have worked with to make preparations for the final needs (funeral home, cemetery, etc.). They probably have also worked with an insurance broker to obtain life insurance and property insurance too, and likely have a relationship with someone at their bank. Getting the names and contact information for any and all financial advisors, including brokers and self-managed accounts will also be very important. Try to get as complete a picture as possible of those helping them with their planning and the specific choices they have already made for their future care and financial needs. Once you have a list of their key advisors, it would be helpful for your parents to introduce you to them. These are the people who you will eventually be turning to for help in carrying out parental wishes. Make sure you know where your parents keep copies of their important documents, including any deeds to real estate and their estate plan. Ask them how frequently they have updated such documents and when the most recent changes were made. Also find out who they have named to be their executors, guardians or trustees. More importantly, have your parents check with their advisors to ensure that the beneficiaries named on various insurance policies, retirement assets, and brokerage and other financial accounts are up to date and in keeping with their overall estate planning wishes. You will need to find out what healthcare and living arrangements your parents have in mind for their future. Do they want to be cared for in their home? Do they want extraordinary measures taken to prolong their lives? Who will make decisions about such care if they are not able and who has the necessary documentation on file (law firm, doctors, hospitals)? Your parents may have disability or long-term care insurance policies in addition to Medicare or private insurance and any supplemental plans. Your parents will need to decide if they want to continue to live where they are, or whether they are willing to move closer to the person who will be providing their daily care or consider an assisted living community. You and your siblings should discuss with your parents who will provide care for them, and hopefully come up with an arrangement that is acceptable to everyone. Any good plan would also outline the sources of money that will help pay for these lifestyle changes. Will Social Security be enough to cover daily finances, or do your parents plan to draw on retirement or other savings? This would be a good opportunity to learn more from your parents’ trusted financial advisor, if they have one, about any withdrawal strategies or tax planning that has been put into place. You also need to know whether a healthcare proxy (someone with the legal authority to make healthcare decisions during incapacity) has been named. If one is not named, you or one of your siblings may wish to discuss becoming that healthcare proxy. A healthcare proxy should be someone who medical professionals can easily contact in the event of an emergency. If your parents live in Florida, your sibling who lives in Alaska might not be the most logical choice. Parents should avoid the temptation to split the role between two or more people. The proxy’s job is to make medical decisions on their behalf, often very quickly. Other siblings can delay much needed action if the proxy is trying to build a consensus. In some states it is actually illegal to name more than one person to serve in such capacity at any given time. Your family discussions will ultimately turn to your parents’ estate planning and the division of their assets according to their wishes. This can be an uncomfortable subject, but making sure their wishes are clear and universally understood can smooth a lot of anxiety down the road. Some people prefer to bequeath their assets and belongings after they die, and for that there are wills, trusts and account beneficiary designation arrangements. Others may prefer to give away or jointly title ownership of assets such as investment portfolios, real estate and heirlooms while they are still alive. Either decision should be considered a part of their estate planning. 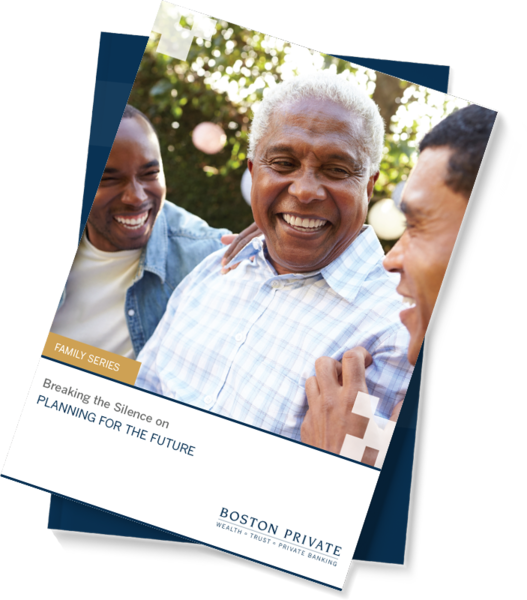 Another key point is to check on whether a parent’s estate plan does what he or she actually believes it does. Often elders can be mistaken about the arrangements they made many years ago. Estate plans should be thought of living documents that need to evolve as a person’s life evolves. A good source of reliable information on this score should be sought from your parents’ attorney (with permission from your parents, of course). Even the best laid plans can cause discord, if they lack specificity or are contrary to what the family was expecting. This is particularly true when it comes to personal tangible property. One can, however, gain assurance that his or her wishes will be carried out by writing a letter to his or her executor. This type of “side letter” or memorandum would detail “who gets what” with respect to household items, jewelry or artwork. On the downside, such written wishes are not legally binding. On the upside, they can be changed at any time without the formalities required by a will or trust and without the cost of hiring an attorney to amend those documents. It is always important to have your parents work with their estate planning attorney to make sure that their directives to executors meet the requirements of the jurisdiction that they live in. It is frequently helpful for the parents and adult children to talk openly about who would like specific things, like Grandma’s silver tea service or Dad’s gold pocket watch. One sibling might only care about the piano that is currently slated to go to someone else. If it appears likely that family members will fight over particular items, it may be worth gifting such items during lifetime or selling them altogether to keep the peace. Some parents will want to split things down the middle, even if that means selling a family business. After all, conscientious and thoughtful succession planning requires a lot of work and forethought. Another option might be to offer a very involved child the business and give any other children something of equal value, such as a vacation property, antiques, or even cash. Be careful, however, because this approach can cause problems too, especially if the value of the business changes and/or the market value of the equalizing property fluctuates a great deal. There are other alternatives for families that don’t want to wait to distribute their wealth. Many of these strategies can help reduce the size of an estate, diminish estate taxes and avoid the probate process. For example, providing for the education of grandchildren is often a key goal for many grandparents. Current tax rules allow grandparents (or any person) to pay tuition and medical expenses for another without any gift tax consequences. Happily, the unlimited exemption for gifts of this type does not diminish one’s ability to make annual exclusion gifts of $14,000 per year (in 2017) as well. With the cost of tuition and medical care being what it is, a person can reduce his or her taxable estate fairly quickly while at the same time providing much needed assistance to the generations following. An advisor can work with you on other techniques designed to reduce an estate that may be subject to taxes while still achieving your family’s values and goals. One such technique is philanthropic giving in the form of outright gifts of cash, or even better, appreciated stock through a charitable trust, private foundation or donor advised fund. Using a charitable trust is a popular approach and also offers advantages. A charitable trust can provide an income stream, lower income tax bills, and set aside family money or assets to support a favorite cause over many years. A private foundation might ensure your favorite philanthropic causes are supported for long after your death. A donor advised fund is a simple, effective way to both administer your charitable inclinations during your lifetime, while also providing the opportunity to engage your children and grandchildren in developing their own charitable values. Remember, while open conversations with your parents are important, these times should not be viewed as opportunities to change minds or put in your two cents. Taking a position or challenging their plans is not what these conversations are intended to do. If there is discord or disagreement or you are just worried that their plans won’t achieve their defined goals, it may be best to bring in a trusted advisor to help resolve conflicts. An objective third party that you all trust could make the difference when attempting to bridge the generations.